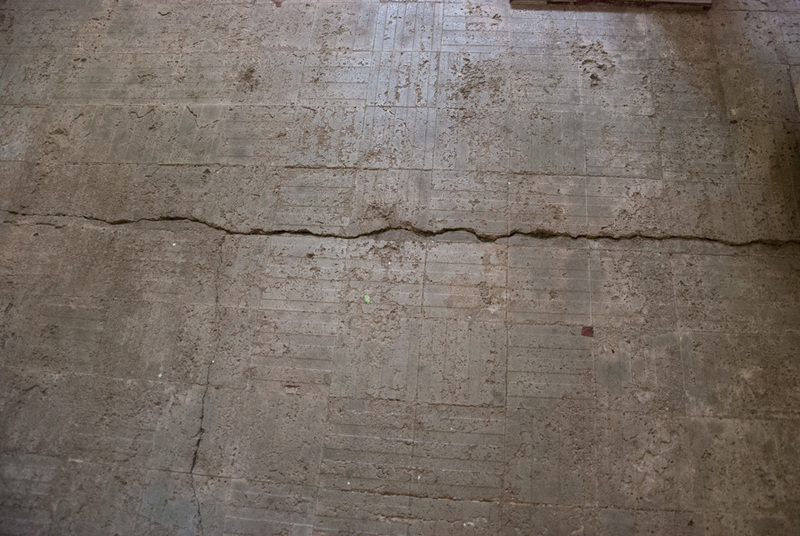 Sorry Tile, but the Cracks Have Got To Go. I closed out 2013 by starting a project and started 2014 by finishing a project. T’was no better way to transition into a new year in my opinion! To give a little backstory before going into the project. 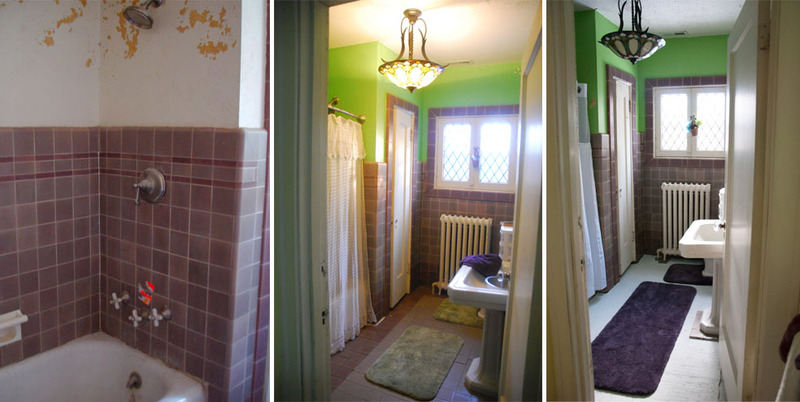 . . when we first bought our lovely old home, its only full bathroom was a hot mess. We had to get it in working order before we could even move in. 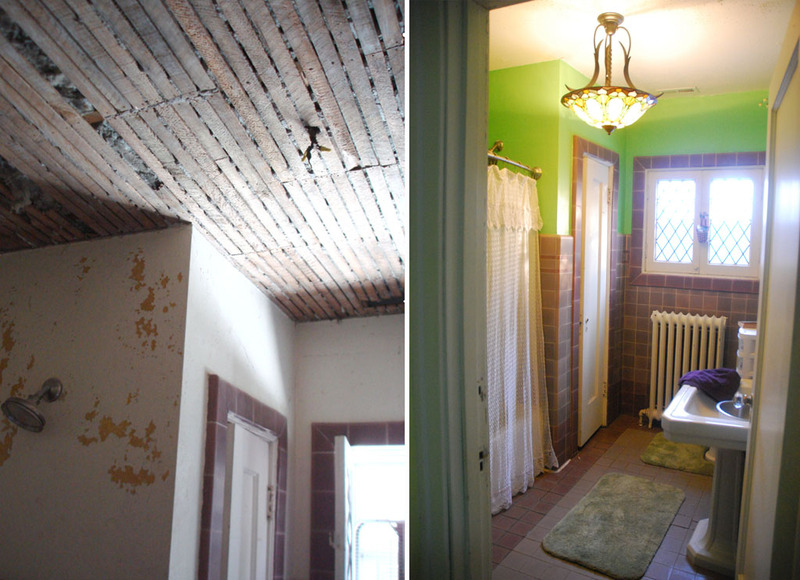 We did the big things – take out the crumbling ceiling mess, stick in a new ceiling, fix the toilet so it was usable, fix the shower so it was usable, clean out the tub so it wasn’t terrifying, and re-plumb the sink to actually work. The tile, though purple, was great. I love old homes and old homes have tile, therefore, I love tile. Unfortunately, we began to notice a consistent drip in our foyer below every time someone took a shower. Ugh. We cut out the old caulk and re-caulked around the tub. This seemed to do the trick, for the most part. Until the day the shower liner was wonky and didn’t prevent mass amounts from getting onto the floor. . . puddles in the foyer. Clearly we were just ignoring the cracks below our feet. I mean, they’re HUGE! 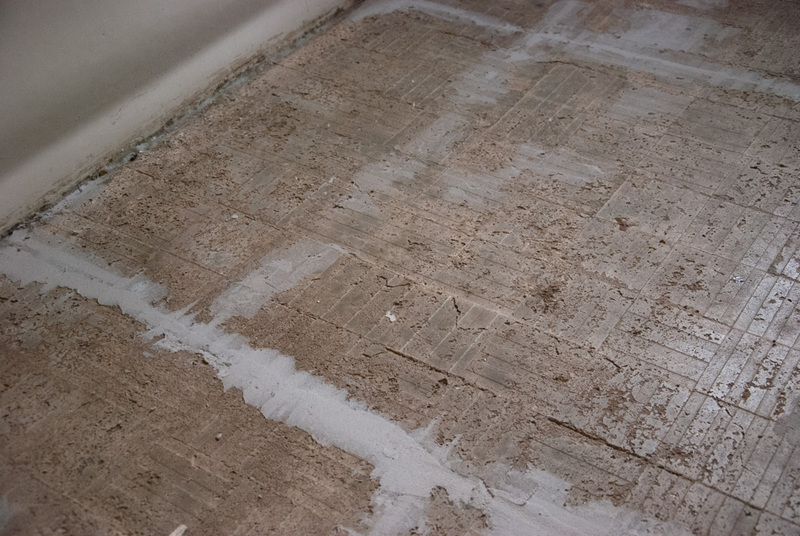 Cue at least 2.5 years worth of “well, should we… no what about… um, how about…” and the grout/cement floor remained. Our solution to the waterfalls in the foyer – rolled up towels at the base of the tub to prevent water from going down the crack. We also, rather stupidly, ignored the fact that the shelf under our shower head that held our shampoos and things was just the right depth out to cause a splash board for the shower which caused water to splash down over the curtain rod itself. However, I think it has something to do with the fact that I never could rid myself of the “ugh, my bathroom looks filthy” feeling. So, some research later and I locked in on a product that wasn’t at Lowes, so I had to venture further out to Home Depot. I generally prefer the Lowes near me because I have no problems walking in, finding what I want and leaving. If I’m looking confused, someone may ask, “can I help you?” but only if I’m practically twirling in confused circles. My closest Home Depot, however, unless I’m wearing ratty jeans, dirty boots and have my hair in a bandanna, I’m asked (on average) five times “ma’am, can I help you find something?” This generally asked as I’m buzzing by, straight for the aisle I need. Frankly, it’s annoying. I like good customer service… but I like customer service that pays attention. Bah, enough off-track talk. Here’s what I collected. 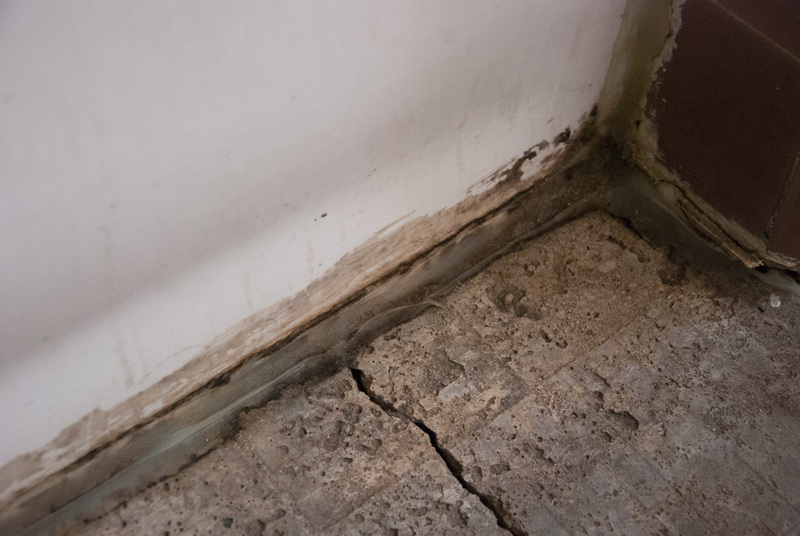 Floor patch, waterproofer, and silicone caulk – I started by vacuuming, brushing, canned-air in the holes and cracks, and re-vacuuming the floor until all debris I could possibly remove was gone. Next, turned on some good ol’ Vinyl Cafe and started slopping in the floor patch. While that dried, I removed the nasty, grime of caulk that was at the base of the tub. Already, it was a huge improvement. Mind you, I say this not thinking “cosmetic improvement.” Simply functional improvement. Finally, I finished out my New Year’s Eve evening with coat one of the Bahr waterproofer. In the morning, to start the New Year off right, I gave it the second coat. It’s a bit of an initial shock no longer having our dark floor, but it quickly gave way to much rejoicing as I could simply wipe away a speck of dirt instead of observe as it lodged itself deeper and deeper into my floor. It will be “fully cured” after 7 days. So far so good on the water works though. OH! I nearly forgot one of my other achievements, my first replacing of a shower head – complete with extender arm to take it past the shelf, and thus, removing the top spray problem. It’s not our dream bathroom yet. 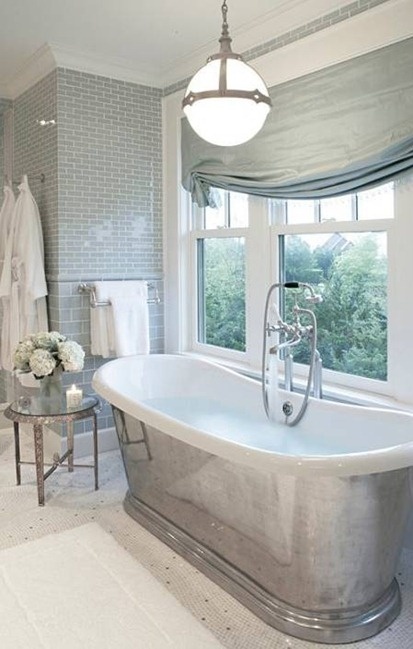 . .
We will certainly use tile, however, the bathroom will eventually receive a full overhaul. 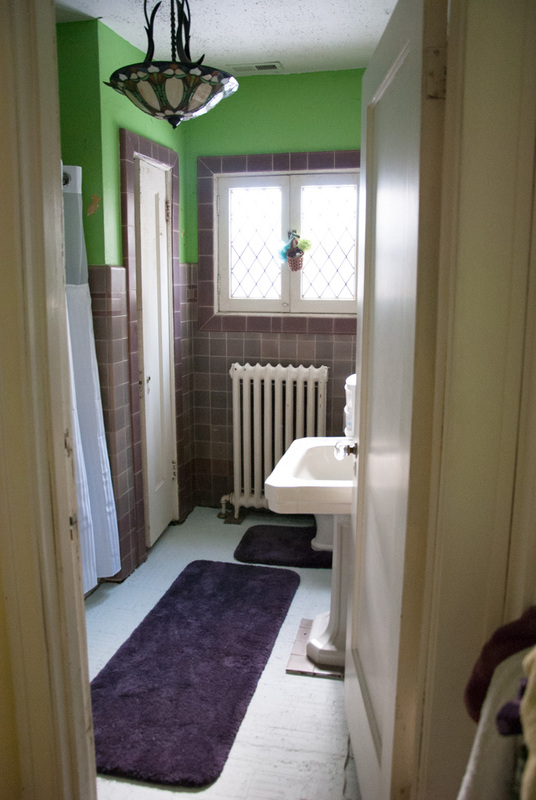 It would also appear, that the purple tile was the 2nd style the bathroom had. 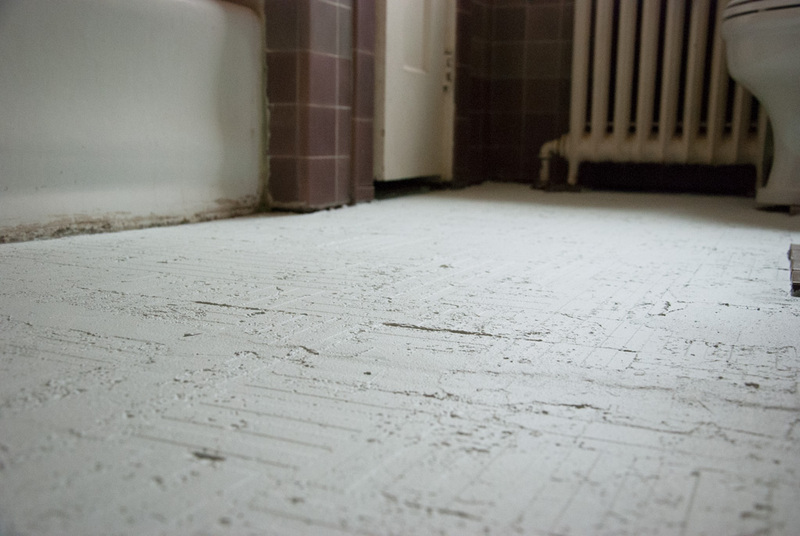 The original tile – found in the bathroom closet, is white subway tile on the wall and white and gray hex tile on the floor. I’m saddened that didn’t stay, but perhaps we can bring that back in the overhaul.